I have now remembered why I don’t particularly like satin stitching. My machine is never very cooperative with how wide I want it and how dense I want it. I’m not too sure whether he looks like he’s winking or he’s drunk LOL but either way he’s stitched down so now I have to think where I go from here. But enough sewing for one day. I spent all day yesterday and pretty much all day today sewing and it was great but I need to clear away some of this mess – plus I can feel yesterday’s marathon quilting session in my shoulders today but not as still as I thought I’d be. Need to figure out what quilt to get layered up to start quilting on next. He turned out pretty cute. I think I’ll maybe used a dark thread to satin stitch around it so it looks more like a coloring book page and the fabric edges stand out more. The red fabric I had received in a prior TLE order – fabrics I’m going to use for a Komen Fund Raiser quilt – but it was just perfect with these fabrics so I snipped a bit off that stack of fabrics. He’s all fused in place and there’s Décor Bond fused to the back so once I pull out the other sewing machine (which I just put away yesterday after mending something) I may see if I can get him stitched down and contemplate the rest of my bag. I’m going to have to make a little shopping list I think. Since I don’t sew clothes anymore, my supply of more clothing type notions — like elastic which I want for something — are pretty much nonexistent. So will have to figure out what else I might want..
That’s what I’m going to call my Loopy Ewe Challenge Bag. 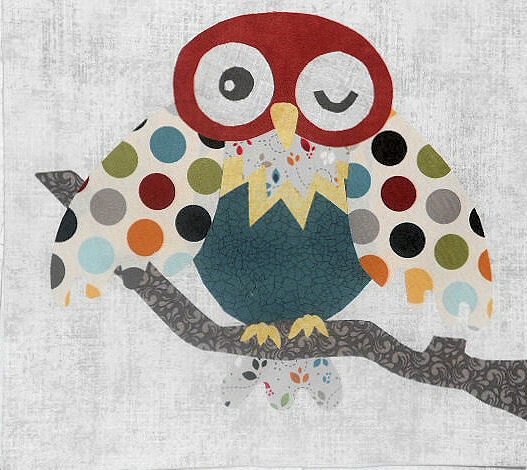 When I chose the fabrics I wanted for this challenge project, once I saw the owl print I was thinking I wanted to use my applique owl block design from the Too Tired to Give a Hoot wall hanging (which I did for the first Loopy Fabric Challenge) as the flap of the bag. 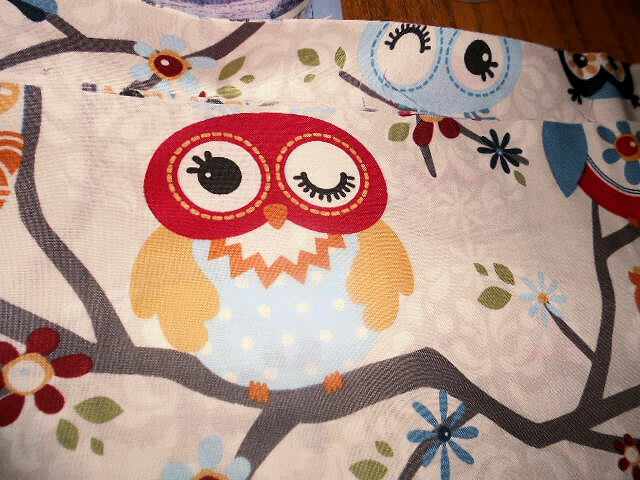 But today in looking at this fabric I decided I wanted to change my owl to look sort of like the red headed winking owl. I think he’s so cute. 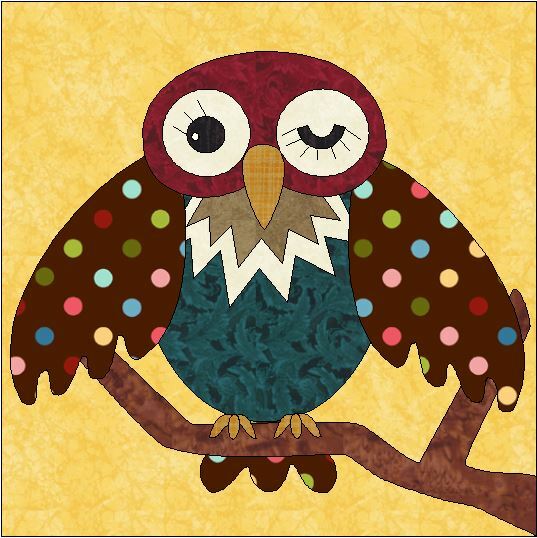 So I pulled up my file in EQ7 and made a few changes to my owl design. It’s not an exact duplicate but close enough. 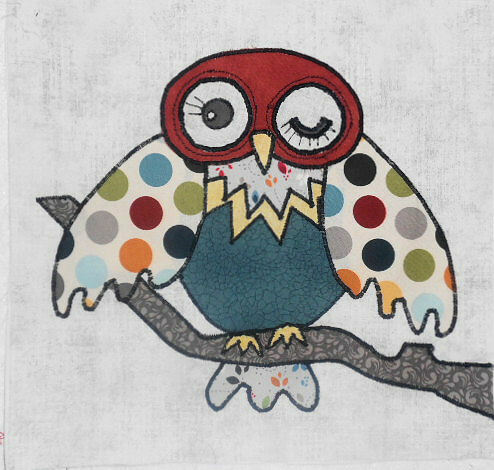 Here’s what my owl on the front flap will look like – not in these colors – but the general look of it. Where I’ll go from there, I haven’t totally decided yet but I’ll start with the flap. Yeah – finally something I can count as finished and out of the stash. My nephew’s music quilt just needs the binding hand stitched which will get done later this week so I’m calling it done! 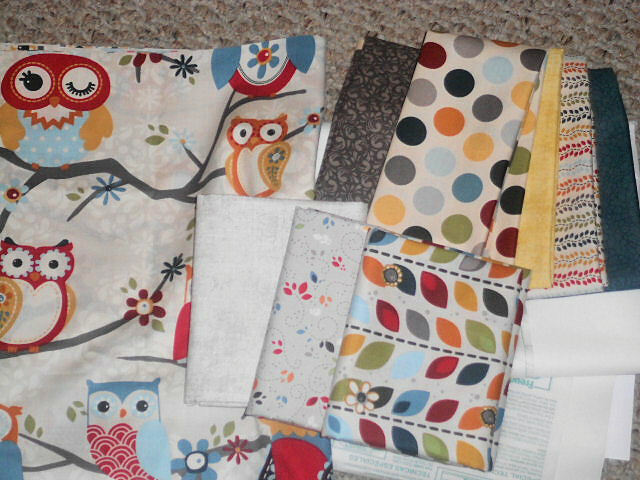 I think part of today’s project will be figuring out what I want to do for the Loopy Bag Challenge with these fabrics. I have my idea I just need to work out the details and sizes, etc. For those who asked about the piano key border in my nephew’s quilt — I most definitely did not piece all those keys! LOL This is a quilt for a college freshman’s dorm room. Not that he doesn’t love my quilts but it is a college freshman’s dorm room. 😉 They are just plain borders cut from fabric printed with piano keys. I did a quick search and I don’t see the specific one I bought on the Equilter website but I was just scanning what came up when I typed in piano keys in the search bar. There are others that are similar and a more thorough search may reveal the one I got if you look. It’s just all rows of piano keys, with nothing fancy in between them, running the length of the fabric. Now I have to go look at the music fabrics to see which ones I still have enough of to make a matching pillowcase. The opening edge of the pillow will use the piano keys around it.